At the Quality Inn in Durango, Colorado, our guests are our priority. We want to make sure you are comfortable and having fun, and we offer many amenities and services to do just that. We even offer tubes for guests to float the Animas River and Brewery packages that include local taps from Ska Brewing, Durango Brewery and Steamworks. If you have a special request that is not included on this list or other questions, please call our helpful front desk staff at 970-259-5373, and we will do our best to accommodate you. No elevator, but our hotel is only two stories. We do everything possible to accommodate those who request the lower floor. 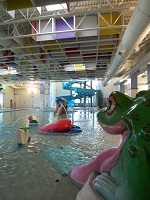 Passes available for the Durango Rec Center upon request (limited number per room). The Durango Rec Center is only one block from the hotel and offers a large indoor pool, rock climbing, exercise equipment and more. Click here for our rates and availability. Hi Amy, I write the blog and manage the website for the hotel, so I don’t know the answer to your question. Your best bet is to call the front desk at (970) 259-5373‎. Thanks!